The General Settings lets you select a website template, choose the colors and background for both desktop and mobile displays, and set your Google Analytics ID. To access, in the side menu click Website Design., then click General Settings at the top. Remember to click Save after changing anything. Click the desired Website Template. Click Preview to get an idea of what the template will look like. Note: Some elements in the examples may differ from what you can actually accomplish due to evolving features. You may need to make adjustments to the Layout Sections at the top, such as deleting duplicate default components. Color variant — Choose a color theme composed of various complementary colors for different page elements. Text size — Choose the default overall font size for the site. This eliminates the need to select text you enter and change its size every time. Website Favicon — Upload the icon seen in the browser tab in which the site is loaded. See our Add favicon to site article for details. Enter your Google Analytics ID in the Account ID field to track traffic to your site. See our Set up Google Analytics on your site article for more info. 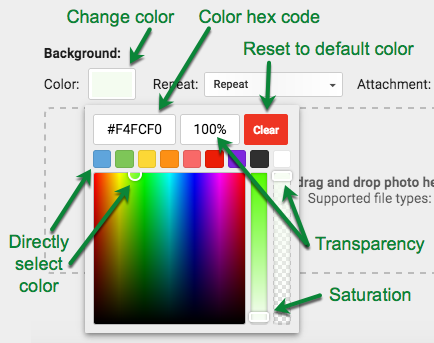 Color — Click Select or the colored box to choose a color that overrides the default theme color. A background image will completely cover the color, although you will see the color outside of the area defined by the Repeat and Size settings, if any. Transparency determines how much anything shows through the color. Irrelevant in General Settings. Saturation determines how light the selected color is. Repeat — When you upload a background image, this determines if your image will be repeated if it's smaller than the browser display area. No repeat — Display the image once in the upper left. Repeat horizontally — Repeat the image in one row horizontally at the top. Repeat vertically — Repeat the image in one column vertically on the left. Repeat — Tile the image both horizontally and vertically. Attachment — Determines if the background image moves with the rest of the content. Scroll — The image moves with the content as you scroll the page; it's attached to the content. Fixed — The image stays stationary as you scroll the page. Has the effect of looking through a window at the background image as you scroll. Size — Sets the size of the background image. Auto — Let the system determine the size. Contain — Size the image so that either its width or height fills the browser window. Cover — Size the image to fill the entire browser window. Image area — Drag and drop an image into the dotted line, or click inside the area, navigate to the desired image, and double click it. Click the in the upper right of the image to delete it. Text color — Change the default team name color (when the next setting is YES). Show team name next to logo — Set to YES and your team or club name (pulled from Business Tools > Team Profile & Settings) will be displayed to the right of your logo. This is useful if you have not uploaded a separate mobile logo and your team or club logo does not clearly display your team or club's name.